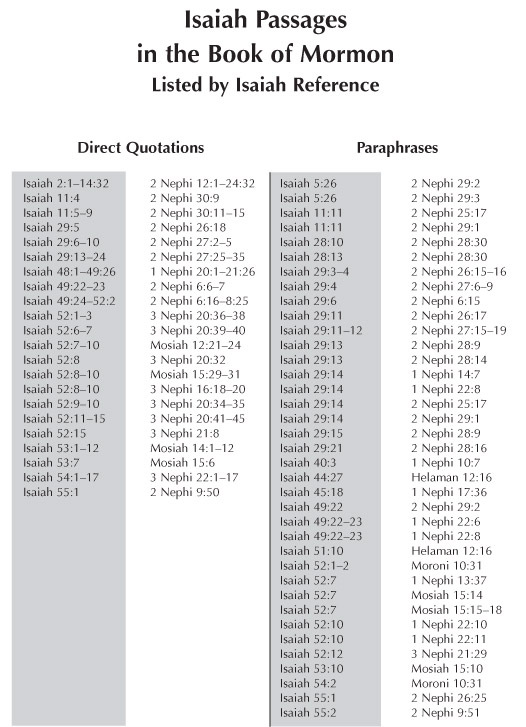 This chart organizes important Isaiah references in the Book of Mormon according to their order of appearance in the book of Isaiah. In 3 Nephi 23:1, Jesus Christ emphasizes the importance of studying Isaiah's writings: "A commandment I give unto you that ye search these things diligently; for great are the words of Isaiah." The direct quotations listed in this chart come from three parts of Isaiah, namely, chapters 2–14, 29, and 48–55:1.